The Fulltone Mini DejaVibe can be seen in the middle of the shot at 0:15. The Fulltone Mini DejaVibe Stereo Chorus Guitar Effects Pedal is used by rock guitarist Alex Turner in his pedalboard for the Arctic Monkeys. Cook's guitar setup revolves around a '60s Simms Watts rig and custom?built Rosewell Bluesman, though for the Sound City sessions, he also borrowed engineer James Brown's Audio Kitchen Big Chopper amp. For more ambient sounds, he'd plug into various toys, including a WEM Copicat or Roland Space Echo, Electro?Harmonix Holiest Grail reverb pedal and Fulltone Deja Vibe stereo phase/chorus. As spotted on his pedalboard, Doyle Bramhall II is using this effect. In this video at 4:45 Chris shows his Deja Vibe. 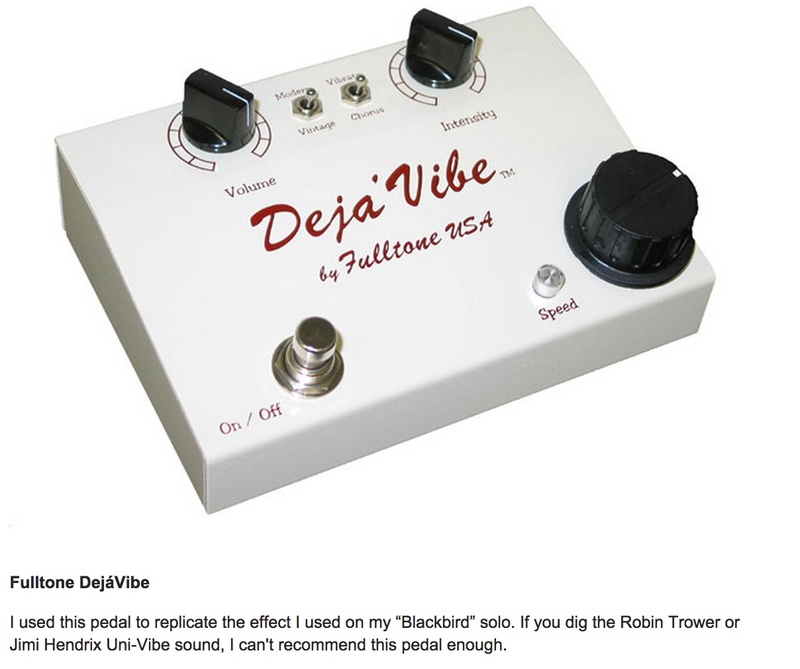 Nels Cline uses a Fulltone Deja Vibe pedal. "I love the Deja Vibe," Cline says at (25:40). In [this interview](http://www.guitarplayer.com/artists/1013/robin-trowers-moody-blues/23663) with Guitar Player, Robin Trower says "Yes, I use the DejaVibe..."
On Fulltone's official website, Paul's artist page contains 3 pictures, one of which shows the DejaVibe.